New York City has two new Grand Award winners, Gilt and Eleven Madison Park, above. 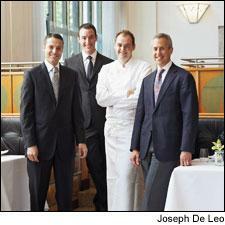 From left: wine director John Ragan, general manager Will Guidara, chef Daniel Humm and owner Danny Meyer. Marking its 30th anniversary, the Grand Award is Wine Spectator’s highest award for a restaurant wine list. This year, five new winners join 69 restaurants—including four from the inaugural class in 1981—that successfully renewed their Grand Awards and thereby earn recognition as the world’s best wine destinations for diners. This year’s winners include Eleven Madison Park and Gilt in New York, Pappas Bros. Steakhouse Dallas, the Pluckemin Inn in Bedminster, N.J., and Restaurante Rekondo, located in the historic and scenic coastal town of San Sebastián in Spain. Full profiles of each restaurant and their wine programs are featured in Wine Spectator’s Aug. 31 issue. Since its inception, the Grand Award has honored the industry’s top wine lists. Award winners typically offer an expertly curated collection of 1,500 or more selections from top producers, appellations and vintages. Each winner has passed a thorough onsite inspection, which evaluated the restaurant’s wine program, storage, service, cuisine and ambiance. New Jersey now has a third Grand Award restaurant: Pluckemin Inn. Sommelier Brian Hider, owner Gloria LaGrassa and chef Juan Cuevas assembled a 5,300-selection wine list and a farm-to-table menu. The only restaurants to currently hold a Grand Award since 1981 are the American Hotel in Sag Harbor, N.Y., Bern’s Steak House in Tampa, Fla., L’Escalier at the Breakers in Palm Beach, Fla., and Valentino in Santa Monica, Calif. In 2011, a total of 3,734 restaurants, located in all 50 states and in 67 other countries, earned one of Wine Spectator’s Restaurant Wine List Awards. At the basic level, 2,827 restaurants earned the Award of Excellence, which honors a quality wine list of at least 100 selections that is well-presented and complements the restaurant’s cuisine. Another 833 restaurants earned the program’s middle award, the Best of Award of Excellence, which honors a wine list of at least 400 selections with either intermediate depth or superior breadth in one or more major wine regions. The complete list of the 2011 award winners is featured in the Aug. 31 issue. All of the restaurants can be found in WineSpectator.com’s Restaurant Search, along with more extensive details about their wine selection, cuisine, prices and key staff. Homepage photo of Gilt by Joseph De Leo. Homepage photo of Pappas Bros. Steakhouse Dallas by Terri Glanger.